Personally, I’ve been feeling a little less than super. I’ve had a few days of late that have been downright lousy. Like the day when 28 of my newsroom colleagues – 25 of them my friends in the newspaper guild – were told to go home. Their services were no longer necessary. They were laid off. I definitely didn’t feel super that day. In fact, from the sound of the way our publisher talked on Black Tuesday, the paper didn’t seem so super. Our national advertising was in the crapper. Our revenues were lagging. Our business, as it stood on June 21, wasn’t sustainable. Thus, we marked the first day of summer at The Indianapolis Star, by pulling out the ax. 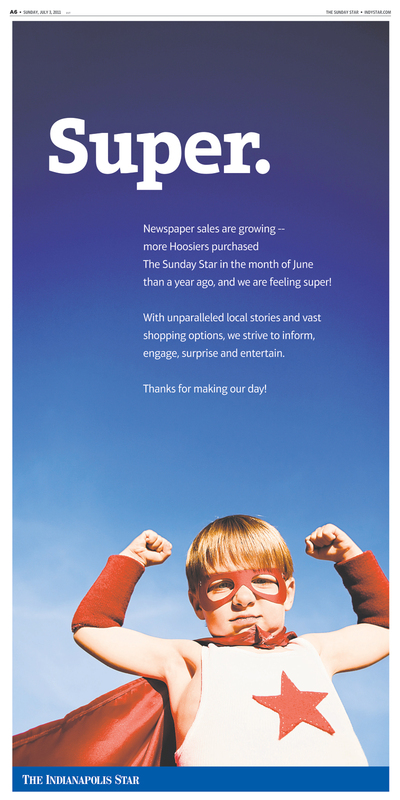 Our newspaper sales are growing, the ad said. And “we are feeling super!” Note the exclamation point. That means it must be really super. Unless, of course, the Star was growing while those people were still here. Could it be that we were super all along? Everybody says we’re still making a profit. Now we learn that our readership is growing. Of course, our executives at Gannett have been getting big bonuses. And our company earned a $500-million profit last year. All that sounds pretty super. I wonder, then, how our friends who were laid off feel. Some of them don’t know how they’re going to pay the light bill, eat, keep a roof over their head, pay for their doctor visits and keep gas in the car as they look for work. That sounds less than super. The one good thing out of all this is that, now that the Star is super again, the rest of us who are still working here should be in line for a super pay raise! Note the exclamation point. That means really super. The Guild has been getting several questions about severance payouts for the employees who were laid off last week. After meeting with Star HR director Olivia LaMelle, this is the best information I am able to provide. First, for the duration of your severance, you will continue to be paid on the Star’s regular paycheck cycle – that is, every other Friday. If you have 8 weeks of severance coming to you, that would be the equivalent of four more paychecks. The money won’t be coming in a lump sum. Second, the Star’s next payday – both for those laid off and those still employed here — is July 8. For those laid off, that check should include not only your regular pay but the compensation you’re entitled to for any unused vacation or personal leave time. Third, this July 8 check – and all those that follow — will be free of the deductions you were accustomed to seeing in the past — things like the parking fee, the newspaper subscription and items you elected to have deducted. The exception, of course, is taxes. LaMelle said she hopes to be able to give the seven people listed above an idea of their exact length of severance by the July 8 paycheck. If you have questions, I urge you to call LaMelle directly at 444-8165. You can always call, Guild president Bobby King, at 444-6089 or 509-9026. I may not know the answer to your question, but I will do my best to chase it down.